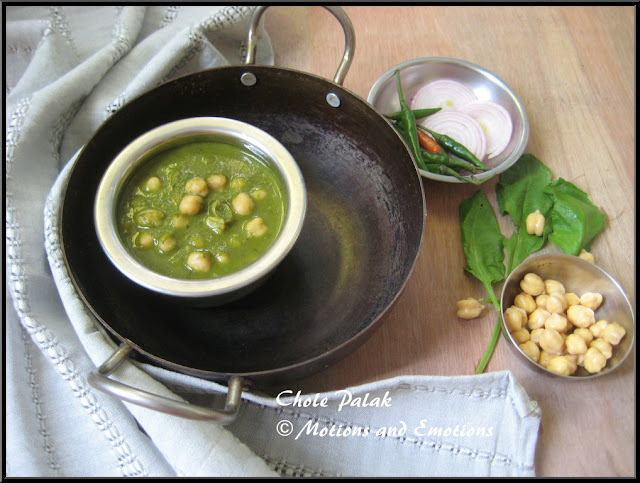 Chole Palak / Chickpeas in Spinach Gravy/Garbanzo Beans in Spinach Gravy is a healthy and nutritious side dish. This is a tasty dish prepared with few simple ingredients which is available in our pantry. Normally we cook chickpea as Chole Masala (Chickpeas cooked in onion-ginger-garlic gravy with lots of spices). Palak/Spinach is one of my favourite leafy vegetable. I thought why not combine these two ingredient together. Coming to the recipe... Preparation time is more in this recipe. If you do the cleaning and sorting of spinach leaves previous day, the dish can be prepared within half an hour. If you notice, I have not added ginger paste in this recipe as I feel ginger does not go well with Spinach whereas garlic complements well with spinach and enhance the taste. Normally when I cook leafy vegetables I avoid adding tomatoes instead I prefer to add lime juice to get the tanginess in the gravy. 1. Soak the chickpeas for 4 to 5 hours. You can soak overnight too. 2. Later drain the water and pressure cook the chickpeas for 3 to 4 whistles so that they are soft but at the same time retain their shape. 3. Choose the clean leaves from palak/spinack bunches and blanch them for few minutes. 4. Drain the water and make a smooth green puree. 5. Now heat oil in a pan and add a cinnamon stick into it. 6. After that add onion and garlic paste into the oil and cook well. 7. Once the raw smell of onion is gone add palak/spinach puree and green chilli paste. 8. Keep on stirring it under low to medium flame. 9. Once the palak is well cooked, add coriander powder, cumin powder and salt according to the taste. 10. Mix all the spices and now add the boiled chickpeas into the gravy. 11. Now add 1/2 cup of water and allow the curry to boil for 3 to 4 minutes. 12. Finally add lime juice and switch off the gas. 13. 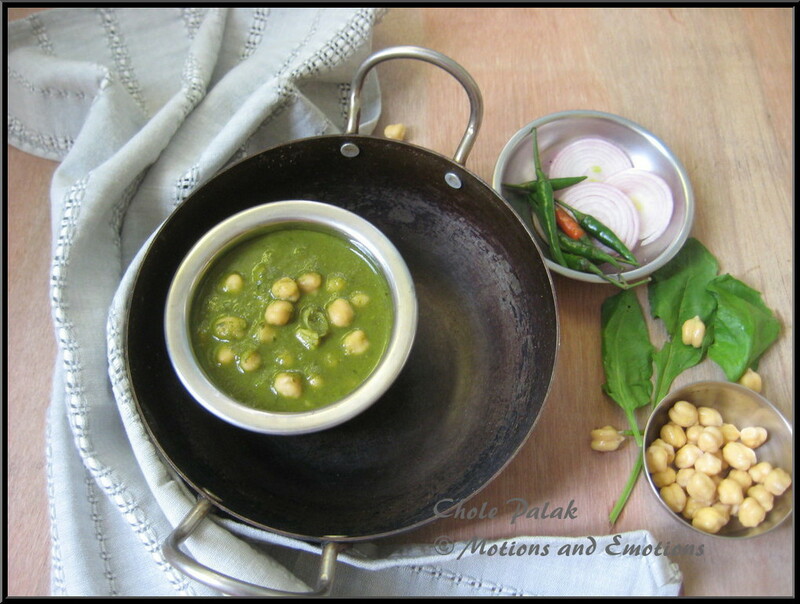 Serve hot chole palak with any Indian bread. 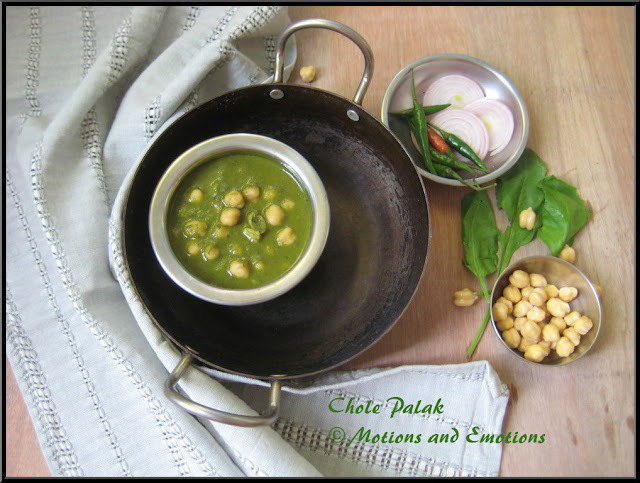 Chole and palak makes it really healthy together !! Lovely combo.. I make it too. Love the clicks and this recipe.. Healthy and yummy!Lovely color combination. oh thats great.. I will make some pooris with it.. This is good combination of palak and chhole.